Ok, I'll start with the basics. A humanoid is something that resembles a human being. Atacama is a high-altitude desert on the western coast of Chile, and is said to be the driest desert on earth. What do you get when you mix humanoids with dry South American deserts? Turns out you get some extremely high strangeness. The Atacama Humanoid (actual size). This is The Atacama Humanoid. It's a dried-up, shriveled little beasty that someone discovered somewhere in the Atacama desert around 10 years ago, and it's only 6 inches long! That's right, it would fit in your shoe! It could sleep inside a butter dish! But it can't sleep because it's dead. That's where the Atacama Desert comes in. It's an awful place. No life exists there, not even microbial life. It's so barren and awful and lifeless that NASA uses it to simulate the surface of Mars when my place isn't available. Even though life doesn't exist there, living things do sometimes wander in and die there from time to time, and when they do they are instantly mummified. Which brings you up to date on the whole saga. If you want to learn what the genetic tests uncovered, you're lucky. The UFO researcher has produced a documentary film called "Sirius" about his long quest to uncover the truth about UFOs and about the Atacama Humanoid, and it premieres online tomorrow, Monday, April 22nd, 2013, at yekra.com/sirius. “'Sirius' is a feature length documentary that follows Dr. Steven Greer – an Emergency room doctor turned UFO researcher – as he struggles to disclose top secret information about classified energy & propulsion techniques. Along the way, Dr. Greer investigates new technology and sheds light on criminal and murderous suppression." "Though he feels the pressure of an imminent assassination attempt, he comes upon an amazing find: a possible ancient E.T. skeleton, 6 inches long, is discovered in the Atacama desert. "What they find will completely change the reality of human existence." That's some big talk right there. Struggles to disclose top secret information? Criminal and murderous suppression? Imminent assassination attempt? Change the reality of human existence? It's like "The DaVinci Code" only completely believable! If you're reading this blog, it's a safe bet that you won't pay $9.99 to see this movie, because you clearly value moderately entertaining content that doesn't cost anything. So as a service I will tell you what I learn over the following days and weeks as this story develops. If, on the other hand, you are going to spend $9.99 to see the movie, please be kind enough to let me know, because obviously I should be charging you to read this blog. 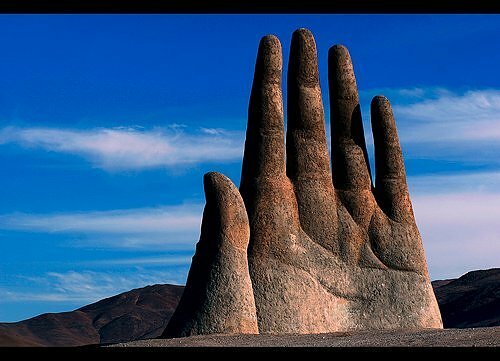 "Hand of the Desert," sculpture by Chilean artist Mario Irarrázabal, located in the wasteland of the Atacama Desert.